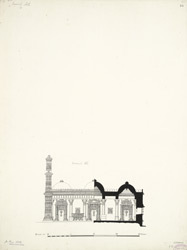 Plan of the Darvish Ali mosque near Ahmadabad, in Gujarat. The Darvish Ali mosque, also referred to as the Khonja Bibi mosque, has an inscription dating the building to 1504. This small mosque consists of an interior extending to 37 feet in length and utilizes four key pillars to support a roof consisting of six domes in two rows. The richly decorated minarets, niches, mihrab, and windows are key features of this mosque and show similarities in style with the Rani Sipri mosque also in Ahmadabad.